Located in the heart of the scenic Rocky River Reservation, Emerald Necklace Marina is a full-service recreational boating facility approximately 5,000 feet south of Lake Erie. Emerald Necklace Café – serving Honey Hut Ice Cream, and service of our full food menu, is open daily from 11 a.m. - 9 p.m. until Labor Day. After Labor Day, Emerald Necklace Café is open weekends only from 11 a.m. - 7 p.m. until September 30th. 1500 Cleveland Metro Park Dr.
Open daily from 11 a.m. - 9 p.m. until Labor Day. After Labor Day, Emerald Necklace Café is open weekends only from 11 a.m. - 7 p.m. until September 30th. Cleveland Metroparks has been operating Emerald Necklace Marina since 2016. Open daily from 7 a.m. – 9 p.m. until Labor Day. After Labor Day, hours of operation are 9 a.m. – 7 p.m. Located adjacent to the popular Rocky River public boat ramps, we have everything you need for a successful day on the lake! Stop in by car or boat for bait, tackle, coffee, snacks and beer to go. Full service ship store covering all of your boating needs. Live bait, fishing tackle, bagged ice, cold beverages, boating necessities, unique gifts and much more. Last day of the season is September 30. Our fuel dock provides non-ethanol marine grade fuel for your boating needs. Let one of our helpful dock attendants greet and assist you at our fuel dock. Pump-out station is available at no cost to the public. Fuel prices vary during the boating season. Please call for current prices. Emerald Necklace Café - serving Honey Hut Ice Cream, is open 11 a.m. - 9 p.m. daily until Labor Day. After Labor Day, Emerald Necklace Café is open weekends only from 11 a.m. - 7 p.m. until September 30th. Our gift shop is stocked full of high quality nautical-themed gift items. We also offer high-quality West Marine boat supplies including dock line, cleaning products, flares, first aid kits and life jackets along with area park maps, coffee, snacks and assorted sundries. Stop in today to see what's new. For dockage information and questions, please contact the Marina Operations Headquarters at 216.881.8141. The in-water dockage season at Emerald Necklace Marina runs from May 15 through October 15 every year. 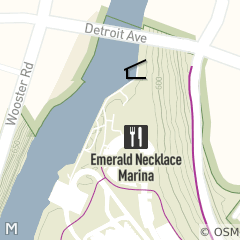 Emerald Necklace Marina can accommodate boats from 6’ to 12’ in width, with a max length of 30’. Water and electric hookups are available for no additional fee. 37 dry rack spaces are leased under yearly contracts. Dry stack operating hours are 9 a.m. -7 p.m. daily during peak season. The gated boatyard at Emerald Necklace Marina is available for summer trailer and boat storage from May 15 – October 1. Customers have access to the boatyard during operating hours and are responsible for hauling their own boats to and from this area. Customers in Summer Boat storage have access to the boatyard during marina operating hours, which are 7 a.m. – 9 p.m. during peak season. A gated boatyard is available to the public for winter storage from October 1 through May 14. Winter storage rates are based on boat size. Scenic Valley Room at the Emerald Necklace Marina. The Rental costs includes time for any set up and break down, as well as all tables and chairs, glasses, plates, and flat wear. A basic linen package is also included with all rentals, black or white table linen and linen napkins. Any additional or upgrade of linen is available for separate cost.